Jez, enjoyed the show, now I am a fan of your music. Stunning performance. Thanks for your time and talent. And I'm not surprised I was sleeping merrily through it. It's beautiful. Thanks for posting it, Jez. Well, listened to the show last evening on my iTouch and loved it. It was a perfect setting for soldering up a new CV2MIDI circuit board for my touch ribbon controller last night ! Keep the nice work going Shane ! Been a while since I have last posted here. My apologies to anyone that tuned in last night to find that there was NO SP09 show. Aside from my normal wireless problems that I often experience, Verizon had a massive data outage and all broadband mobile users were out yesterday for many hours. Unless there is another surprise ... I will resume as normal next week... same time same place. 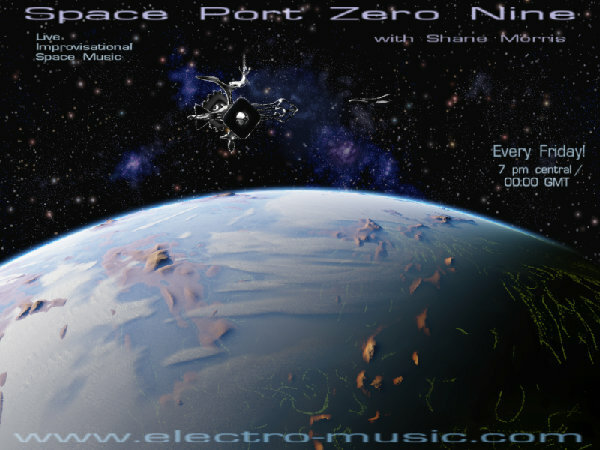 Next Week will be a special 2 hour Space Port Zero Nine. I will be featuring music from the recent Kansas City Regional electro-music Festival. Next weeks program will feature the Friday night collaborations, of which I participated in along with Emerald Adrift, Kevin Kissinger, Damon Mar, and Tom of Restless Breed. Hey, with all this technology, things are bound to happen .... Look forward to hearing the collaborations next week Shane However, we did work Les & Sunshine hard to fill in for you ... They ALMOST made it to the full two hours and did an admirable job !! thanks guys... i appreciate you lending me your ears for a while! yeah Shane that was great! Glad I could hear some of your KC show. WOW, what a poster ..... Jez, great work .... and great show Shane BTW. Funny thing, just as the show was ending, my computer battery when low and began to shut down .... So I am here to say ... great show Shane !!! I like sitting out back on the deck and chilling out to all the great music ! Thanks a lot Paul and Bill!!! Glad you liked it! BTW, Bill the poster is by Rob Sol. Yeah it was great stuff - and now you have a cool poster as well! thanks stefan and jez! wonderful having you guys in the chat room more often now! Aug. 28th will be the 4th and final installment of the KC Regional electro-music festival. DJ Unique from Kansas City, Mo. the last part of the show I will do a short improvisation. Enjoy!